Lauren Belfer has produced a grand, glorious, and occasionally disappointing tale of medicine, war, love, and other things in this 527-page historical novel. This is primarily a fictional account of the discovery and development of penicillin soon after the United States’ involuntary entrance into World War II. Belfer sets the scene well, convincing the reader that Pearl Harbor was an overwhelming experience for the average American; quite comparable to 9/11. The primary character is one Claire Shipley, a photographer for Life magazine, which literally provides her with the credentials to witness history in the making. Claire eventually meets and falls in love with James Stanton, the physician who is heading the government’s military-based efforts to develop the new drug on a massive scale. Claire can relate to the importance of Stanton’s mission since her daughter died of a blood-borne disease at a young age, a disease that might have been halted by penicillin. One early surprise about this novel is that Stanton reports to a civilian authority figure in Washington, D.C.—a man by the name of Vannevar Bush. Bush, a key scientist and organizer of the project that leads to the development of the atomic bomb, comes across as a very serious and intelligent figure, yet with a touch of playfulness. With Bush, Belfer succeeds in bringing a lesser-known historical figure to life. She also succeeds, at least during the first half of A Fierce Radiance, in juxtaposing two stories: the story of the medicine, science, and sheer luck behind the development of a life saving drug, and a love story. Claire and James meet the love of their lives when they meet each other, but each has issues and problems that make their becoming a couple unlikely. Each has perhaps seen a bit too much of life by the time they meet. If Belfer has played it safe to this point, she soon gambles with the reader’s patience and understanding. This is because a murder affecting one of the major characters occurs, turning a two-headed story into a three-headed one. Now the novel is not just about the war and medicine and love during wartime, it also becomes a crime mystery. It seems at first a bit much especially when—wouldn’t you know it—a New York City Police Department detective (wise and grizzled) enters the scene. Of course, the author has provided herself with a very broad field to work in here; one can tie together a lot of loose ends in almost 530 pages. 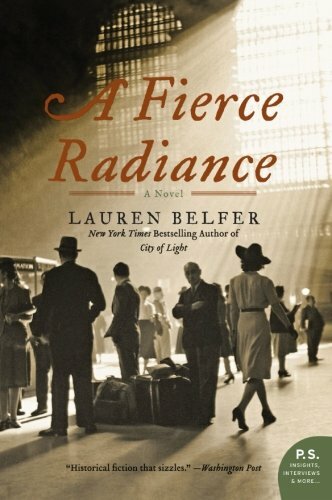 What Belfer does so well is to write in a voice that makes the reader feel “calmed and safe.” There’s a patience and politeness in the voice that will seem familiar to readers of Anna Quindlen and to those who have read the other recent novel about life in the U.S. during World War II, The Postmistress by Sarah Blake. It’s as if the oh-so-calm voice does take us back to an earlier time with ease. Yet there are at least two problems with the telling. First, the omniscient point of view of the narrator becomes tiring and also keeps the reader from knowing each of the characters as well as we would like. Because the omniscient (godlike) narrator goes into the mind of every character, the author skimps on well-rounded character development. This becomes frustrating to the reader and may be a major reason the omniscient voice is used less and less in today’s popular fiction. Next, while Belfer has written a story that reads like an overly long screenplay, if it happened to be made into a film, most viewers would be far from satisfied with the ending. The author does not take the easy way out, not at all. . . . Instead she ends the story with a whimper rather than a bang. In this she may have successfully reflected the happenings of life in a truer way than it might be displayed in a glorious and highly dramatic Hollywood-style ending. This may well be to the author’s credit but it is asking a lot—in fact, far too much—of a reader to devote more than 500 pages to a story that sometimes sizzles before it blandly fizzles out. Joseph Arellano has served as a government agency Public Information Officer, and has done pre-publication editing and review work for a publisher based in England. His book critiques have been featured in several publications including San Francisco Book Review.